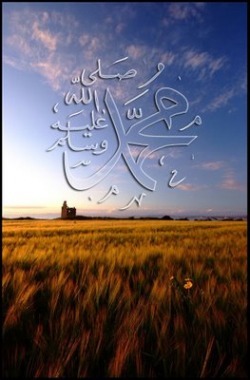 Islam came to be in the seventh century down in the Arabian Peninsula and was founded by a prophet known as Muhammad. 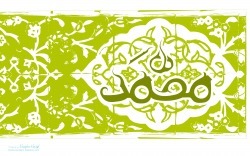 (Islamic tradition doesn't allow pictures of the Prophet, his family, or living creatures in artwork to help avoid idol worship, so in accordance with that belief, I'm gonna stick to traditional Islamic art in the pictures). Born in 570 a.d., in the city of Mecca, Muhammad was orphaned at a young age so he was taken in and raised by his uncle. When he was 25 he married a wealthy widow named Khadija and made a pretty good living working as a trader. Muhammad’s life as a prophet all started in the month of Ramadan (July to us Westerns) in 610 a.d. when he was meditating by himself in a cave in the mountains near Mecca. Muhammad had been known to withdraw and meditate, partially because his city's idol worshiping habits and obsession with materialism bothered him. At the time, you see, Mecca was a flourishing city of commerce and drew people from all over, many of whom brought their idols with them. On that particular night (thereafter known as the night of glory) the angel Gabriel was said to have paid Muhammad a visit and began to give him a series of revelations that would span the rest of his life. Muslims believe that these revelations, collected in a book known as the Koran (alternately spelled the Quran), where the last revelations of God to humanity. You see, some people mistakenly think that Muslims worship a different God than Jews or Christians, but they do actually believe in and worship the God of Abraham, Moses, and Jesus. They believe that the same message as the one that was revealed to Muhammad was also revealed to these earlier prophets and other prophets all over the world. However they think these earlier revelations were distorted over time by men and can no longer be fully trusted. They believe that Muhammad was the last of these great prophets and that the Koran is purer than other holy books because it is solely the word of the one true God and does not include commentary or interpretation by man. The main difference between Islam and Christianity is that although Muslims recognize Jesus as a prophet, they do not believe that He was anything more than a man and do not believe that He was actually crucified but only appeared to have been. They do however also acknowledge Mary, the mother of God as a model of chastity and she is highly praised in their tradition. In fact, she is mentioned more times in the Koran than in the Bible! In 621 a.d. Muhammad underwent “al-Mi’raj” or a night journey to Jerusalem to the ruins of what was once the temple of Solomon described in the Old Testament of the Bible/Torah. 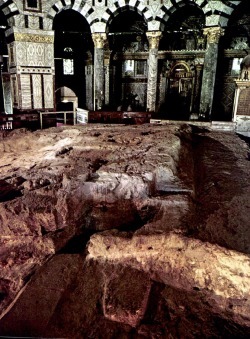 Muslims believe that while there he prayed on a rock (the one pictured to the right to be exact) and was lifted to Heaven and saw a vision of the great prophets of monotheism (religions with only one God). These prophets included Adam, Moses, Abraham, Aaron, Enoch, Joseph, John the Baptist, and Jesus. To this day there is a temple on the spot known as the Dome of the Rock and Jerusalem is the third holiest place in Islam. 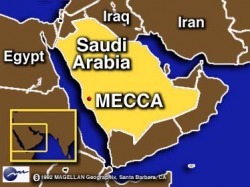 The people of Muhammad’s home town of Mecca however did not take kindly to his message, as they saw it as a threat to the pilgrimage of idol worshipers who often brought business to Mecca. At first Muhammad and his followers were only ridiculed but later, things got so bad they they were physically attacked and endured an assassination attempt toward Muhammad. So in 622, the Prophet and a group of his followers had had enough and decided to journey from Mecca to a city called Yathrib. This journey was known as Hijra and marks the beginning of the Muslim calendar. This city later became known as Medina (city of the Prophet) and is the 2nd holiest place in all of Islam. 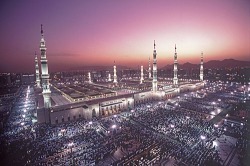 While in Medina, Muhammad continued to receive revelations of the Koran and to develop Sharia which is the “way” or “path” that Muslims follow in life. Later, battles broke out in Mecca between Muslims and polytheists (idol or multiple god worshipers). However in 630 Muhammad and many of his followers marched into Mecca and the city surrendered without further bloodshed, realizing that the tide had turned from idol worship and toward Muhammad and the Muslims. Muhammad then returned to Medina and lived there the next few years, rallying most of the Arabian Peninsula to the call of Islam. In 632 he and thousands of his followers made a pilgrimage to Mecca. 3 months later he died in Medina and was buried there in what is now a Mosque.